OK, so I warned you that there wouldn’t be a blog post for a while as we were going to be on holiday in the Caribbean … and while there wasn’t a blog post, there was some puzzling on the boat, so it’s only fair that I tell you about it. I took a few tray packing puzzles along for the ride because they’re so easy to pack and pretty hard to damage. I also took one of the IPP33 exchange puzzles that I hadn’t managed to solve yet in the hopes of making some progress on it and finally I took a puzzle that one of my MPP mates had sent to me a few days before I left on holiday… and those three little pieces still have me flummoxed – so much so that I’m probably going to build it into my exchange puzzle for IPP34 … which means I won’t say anything else about that one until after IPP. When I was in Japan last year I bought a bunch of puzzles from Mine [Mineyuki Uyematsu] – many of them tray-packing puzzles and I’ve been slowly working my way through them ever since – I’m not very good at them so they end up giving me incredible puzzling value for money. 4 Snakes plus 2 is a great extension of one of the classic tray puzzles, albeit a little disguised. You get a 7*8 rectangular tray with 4 identical black snakes, a red snake and a green snake and a 1*7 rectangular piece. 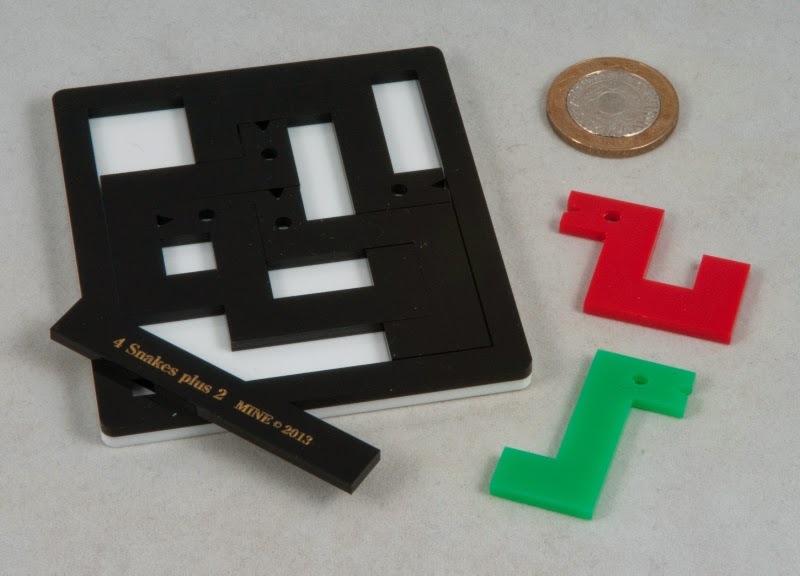 The first challenge is to place the rectangular piece along the bottom of the tray, thus turning it into a 7*7 tray and then fit the four black snakes into the tray… there’s only one way to do that and if you haven’t seen this sort of puzzle before it will confuse you for a while because your brain will keep telling you to do the wrong thing… once you work out the twist to this puzzle, you’ll find they fit in rather neatly – only just. The second challenge is to pack the four black snakes along with the red snake into the 7*8 tray. In spite of having loosened up the little grey cells on the first challenge, the second challenge is a pretty tough ask. Adding just one row along the bottom really doesn’t seem to give you enough space to add in the red snake … and their shapes have clearly been chosen to make sure that there are a lot of ways of almost getting them to fit. I resorted to trying to find “efficient combinations” of the shapes and then seeing how those could be combined and that in turn led me toward a solution I might not otherwise have stumbled across. The final challenge is to pack three black snakes, along with the green and red snakes and the rectangle into the frame… I was thoroughly convinced this one wasn’t possible for quite a while… there’s an obvious place to start, but that won’t help… you’ll need to throw all of your preconceptions out of the window to stand a chance on this one. After spending absolute ages on this one challenge, I went back to my “efficient combinations” and discovered something interesting with one of the new additions, which gave me an extension that looked like a promising starter-for-ten … and from there finding where to put the other pieces turned out to be reasonably straight forward. 4 Snakes plus 2 is a brilliant, compact little puzzle – excellent for a little puzzling in between visiting idyllic Caribbean islands. The three challenges will give anyone from muggle to metagrabologist a decent challenge. Square Birdcage XL is the second tray-packer from Mine that I took along on the cruise. 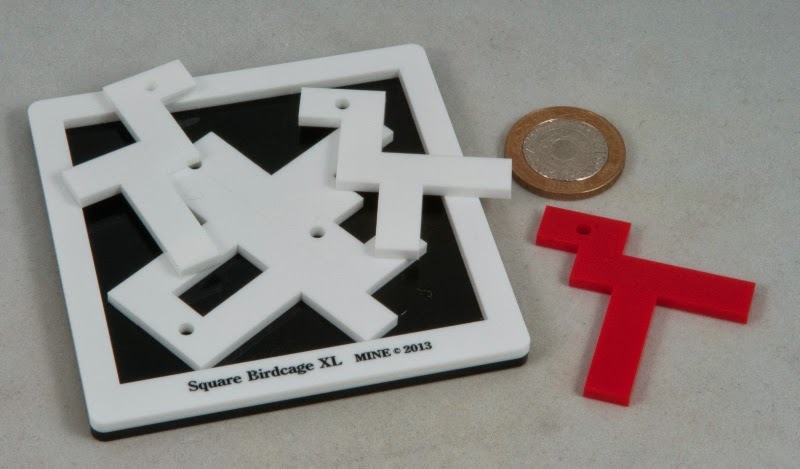 You have a square tray, 8*8 units which serves as your birdcage and a set of 5 white birds (use your imagination a bit!) and a red one. The first challenge is to pack the five (different!) white birds into the cage and the second challenge is to pack 4 white birds and the red bird into the tray… the second one filled me with dread before I even started playing with this one: finding the right four white birds and getting them crammed into the cage along with the red bird was going to be a nightmare. I started at the beginning – find a way to get all five white birds into the cage – at least I knew I had the right pieces that way! Starting to experiment with how the birds fit in the cage and interact with one another you quickly discover just how mean Mine’s been in the basic design of these birds. They protrude at the most inopportune places and getting some of them to work together makes you feel like you’re making progress, only to discover that it’s impossible to put the last bird (or two!) into the cage. Even resorting to the classic trick isn’t a huge amount of help since there are five birds instead of the more usual four pieces. Ultimately finding a solution requires noticing something ‘interesting’ about some of the pieces and then finding a very efficient way to use that insight, and even then you’ll find the solution has a surprise in the middle and, as all good solutions should, the pieces will rattle in the tray. One challenge down, now onto the one I’ve been dreading! How to select the right four white birds to fit in the tray with the addition of the red bird… at this point, thankfully, I slowed down and gave it a bit of thought, and ended up solving the second challenge way faster than the first one – odd how we sometimes convince ourselves something is going to be awful and it turns out to be a lot less daunting that we’d thought it might be. It consists of a board with sixteen holes arranged in a 4*4 grid. Behind each hole is one of four colours. Along with the board you get a chain in a continuous loop with sixteen dots affixed to the loop at fixed intervals. Twelve of the dots are white (and opaque) and the others are clear. 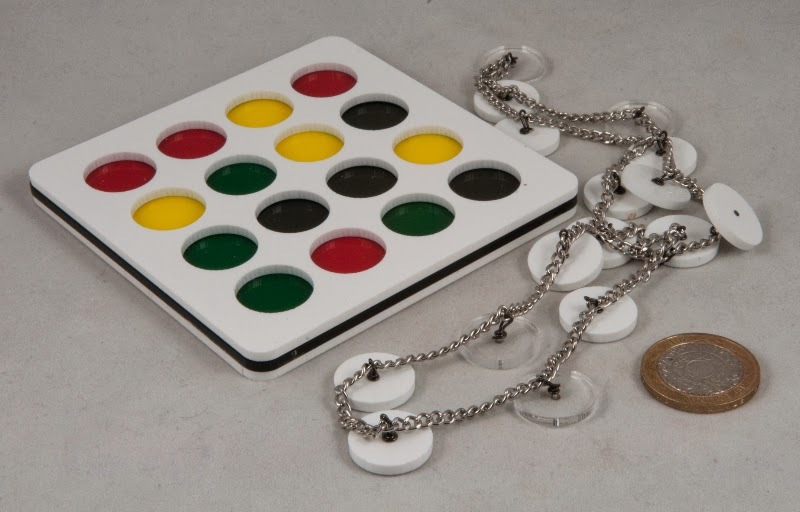 Your challenge is to lay the chain over the board so that the dots go in the holes in the grid such that the clear dots all allow the same colour to show through. The gaps between the dots on the chain are long enough to allow successive dots to be adjacent (diagonally or orthogonally) in the grid, but not long enough to allow you to skip a hole. Given the chain is in a continuous loop, the first constraint is that you need to be able to actually reach all of the holes, so building from one end isn’t always a good idea as you can easily find yourself in a corner with nowhere to go. Once you get the hang of that, the clear disks need to be able to reach all of your chosen coloured holes, so it’s probably worth checking that before you waste too much time on a particular tack – like I did! It took me quite a while to get used to just building valid loops (irrespective of the colours showing through the clear disks) and then I started trying to target a particular colour. Now in the exchange Joe had said that the lighter colours tended to be easier, so I started there and after a fair amount of fiddling around I managed to find a valid loop that almost solved one of the colours and then discovered that with a little tweaking, I could turn it into an actual solution. I was somewhat stoked – this puzzle had kept me at bay for many months and I’d finally managed one of the challenges. After taking a photo (proof!) of the solution, I pulled out the chain and started the next one… and before long I’d managed to find all of the other solutions – very satisfying after getting nowhere on it for so long. This is the first time I've seen a puzzle with this sort of flexible constraint on the placing of the pieces - it really forces you to think ahead and plays with your mind. 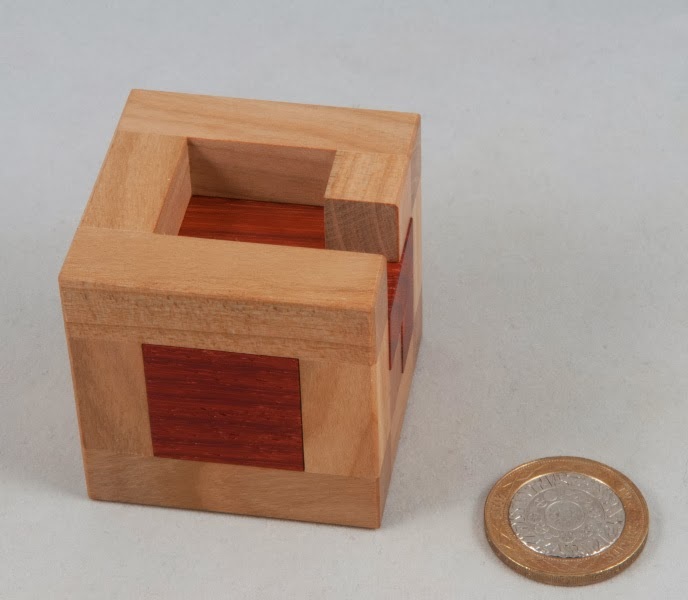 Now Bernhard Schweitzer has a particular passion for TICs, or Turning Interlocking Cubes, having written a couple of articles in Cubism For Fun on this very topic. 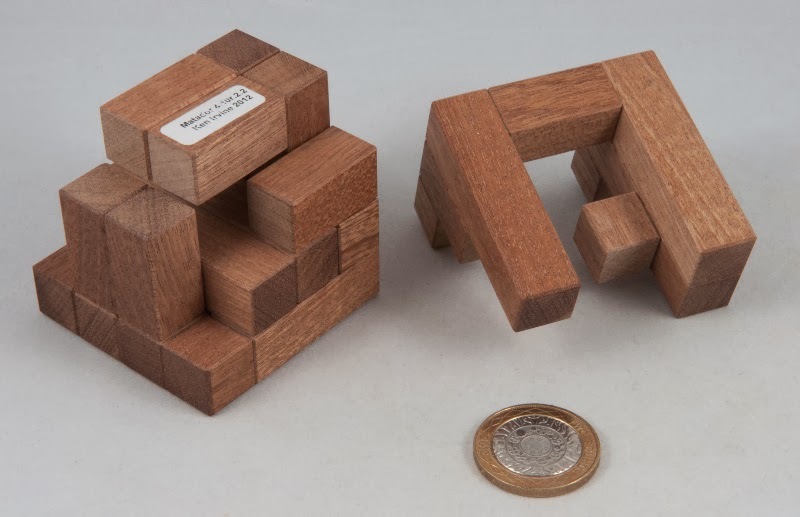 He also has some terrific contacts for getting puzzles manufactured and as a result, the inevitable happened and Bernhard has managed to get a couple more of Ken’s designs manufactured and offered them for sale on his website – where I ordered a copy each of Turnkey and Matador. Each arrived with a little white sticker with the puzzle’s name and a note of the level. Neat! 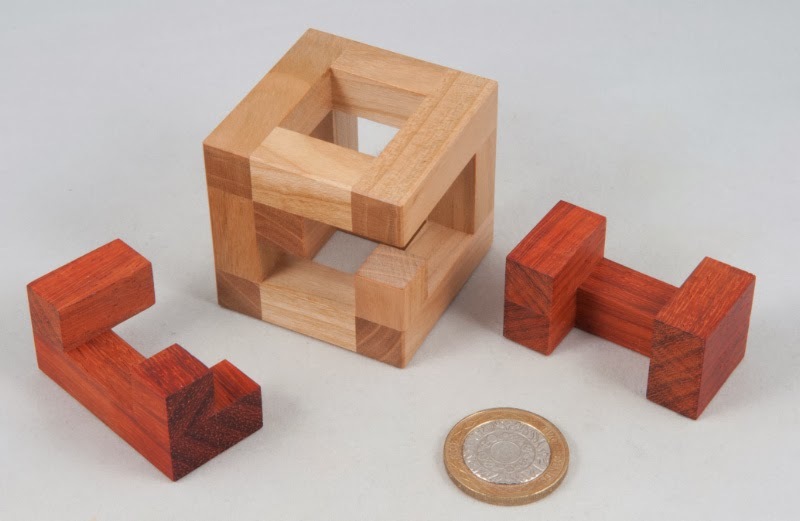 They’re both five-piece puzzles made of mahogany and their tolerances are just right … so you know when you can and cannot make a particular move – quite useful for some of the rotational moves. Matador has a couple of interesting (conventional) moves before the first piece can be removed, leaving you with a couple of ring-shaped pieces and a pair of interlocked pieces running through the middle of them… from there there’s one reasonably obvious move but the next one is a bit less obvious and had me holding off for a while before I eventually realised the only way those pieces could be extracted from the rings was if something in particular could work … and it does … just. As I said, the tolerances are spot on here. Turnkey, by comparison is a far more spontaneous riot of movements. Release the first piece and then the movements get pretty fun(ky) straight away. It would be easy to lose your way on this one and end up tying yourself in absolute knots. My favourite bit is the second last piece to come out - I like that one! Trying to picture how the pieces need to lie in order to admit the last piece, and then how the heck to actually get them there or thereabouts makes for a nice little challenge. I’d been putting together an order from Jakub at the New Pelikan Workshop and just before I was about to finalise it, I spotted a new pic from Jakub on Facebook featuring an interesting caged burr called Petit Puzzle designed by Osanori Yamamoto. I asked Jakub to please add it on to my order and let me know what the new total was, but he refused to take any money for it and told me it was a gift from him. 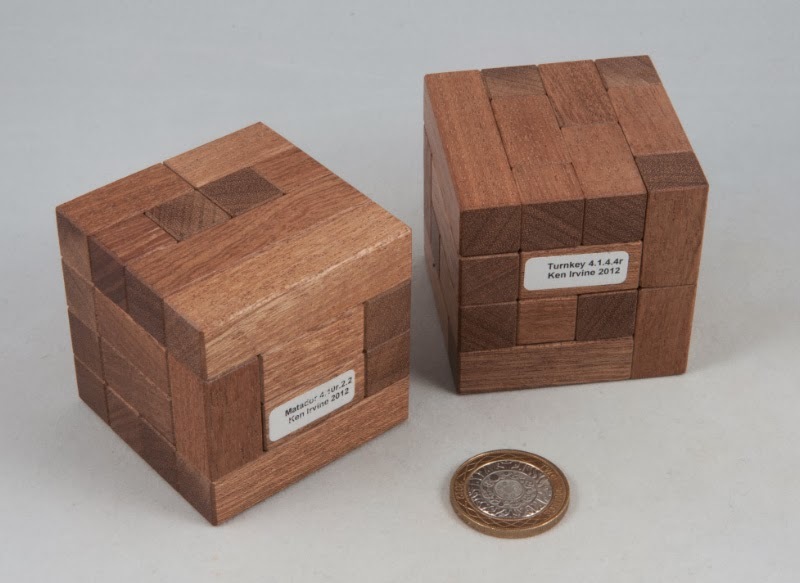 The parcel duly arrived a few days later and this little puzzle is really excellent – with just three pieces, two burr-bits in a cage, it looks seductively simple – I mean, there are only three bits to it – how hard can it be? 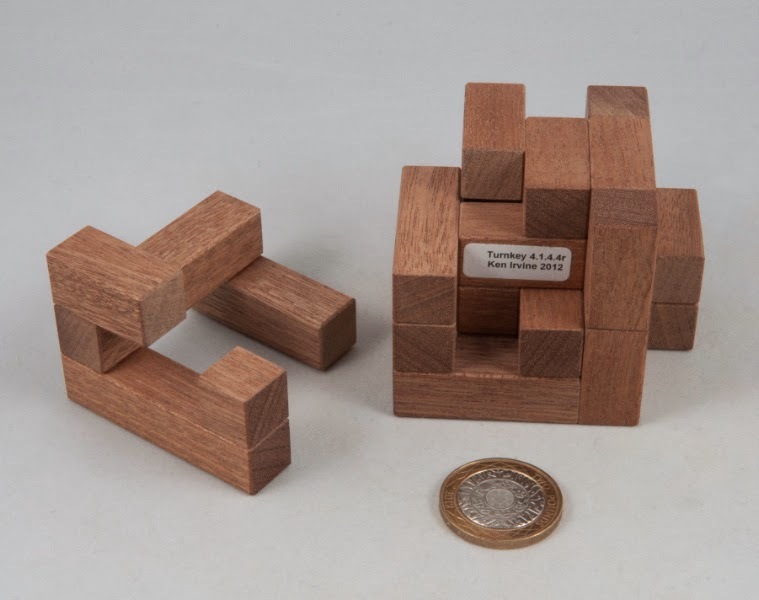 Well, it has a level 11.2 solution… and its designer is well-known for designing “interesting” puzzles. This one’s no exception! From the starting position there are only so many things you can do … and some of them lead to dead ends. Find the right path and you’ll find yourself being presented with a few more forks in the road, some interesting movements and then a view of how things should probably proceed in order to make enough room to get one of the pieces out of the way … and then there’s the little Yamamoto twist in the tail right at the end as well. Reassembly isn’t trivial but shouldn’t take too long – and don’t be put off by the relatively high level – there are a couple of distinct stages to solving this one and each one takes a few moves to accomplish … eminently solvable – even by non-burristas like me! I feel compelled at the end of this little write-up to make specific mention of the quality of this puzzle – Jakub and the New Pelikan Workshop guys have always produced good quality puzzles and charged incredibly reasonable prices for them, but they seem to have stepped things up a gear recently – the quality of this puzzle is easily on a par with that produced by one of my favourite American burr-makers. In fact at the last MPP I challenged a couple of my mates to guess who’d made this puzzle and some of them actually thought it was that American chap – Congratulations Jakub! The quality of your work is astounding for the prices you charge.